I had bought a new beauty rest mattress about this time last year,but needless to say ,I haven't slept good on it from day one.I thought it would break in and get more comfortable but it didn't. So when I read previous reviews on this topper I purchased hoping it would help make a difference,even though I was skeptical. I can't believe it but it has made a huge difference !! It made my mattress comfortable to sleep on,and even though I know eventually it will wear out ,I can sleep good until it needs replaced. I plan on getting one also for my daughters twin bed in the near future. This is by far the best topper around these days !! I have to say THANK YOU to the manufacturers of this product !! Home territory searches the web to find the best prices and availability on Mattress Pads and related products foir your home like Dream Cloud Microplush Mattress Pad. For this page, related items include products we find that match the following keywords: "Mattress Pad" at our vendor partner Walmart - Click More Info / Buy Now to check for price rollbacks!. 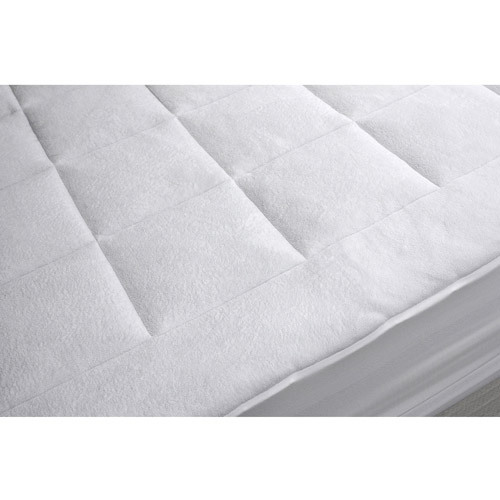 Dream Cloud Microplush Mattress Pad is one of 61 Mattress Pads and related products available for sale through HomeTerritory.com, If you have any questions on this product, please give us a call at 734-971-1210 during the hours of 9am - 5pm EST for assistance. Thank you for shopping at Home Territory, the home furnishings superstore!